Palm's original Touchstone inductive charging dock, first shown alongside the original Pre and WebOS CES 2009, was one of the most heralded mobile phone accessories of all-time. Some users, myself included, even considered it to be an overall better-engineered piece of equipment than the phone it was designed to charge. HP has thankfully kept Palm's induction charging technology legacy alive and made it standard fitment to all of their new devices, including the TouchPad. HP surprisingly included a TouchStone charging dock in the box alongside our 32Gb TouchPad review unit, so read on for our review of the TouchPad's most distinctive first-party accessory. The Touchstone Dock definitely mimics its companion device with a modern, streamlined, white and black aesthetic. It certainly will stand out on retail shelves as an HP-branded item, though some could mistake it for an Apple product at first glance. The dock comes packaged in a miniature version of the TouchPad's rigid white sleeve and contains a matte black interior box containing nothing more than the AC adapter and a smattering of paperwork. 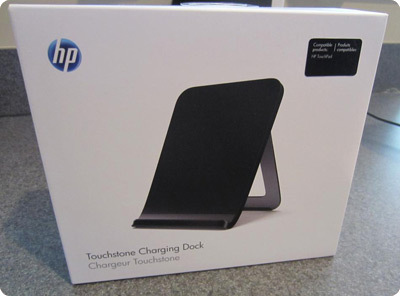 Initially, the HP TouchStone looks a tad more pedestrian than the original puck-like Palm TouchStone dock. While the TouchPad can be positioned in a landscape orientation, the design of the TouchStone tends to favor docking in portrait mode. Moving around to the device's backside, I was somewhat disappointingly to see that the back panel plays host to a fixed USB cord that connects to the conventional cylindrical Palm/HP USB to AC adapter. Again, not a major issue to me but this could bother some users who prefer a removable cable like the original Palm TouchStone. I certainly prefer this arrangement than the deeply-recessed microUSB port on the original TouchStone that rendered it incompatible with many non-Palm cables. Utilizing a rear-mounted infinitely adjustable kickstand, this dock a huge range of adjustability compared to the original Palm dock. The rake of the kickstand can be switched from a nearly vertical orientation to laying almost flat on a desktop, perhaps to make for more comfortable e-book reading or web browsing while being charged. The easy on, easy off nature of the dock makes it ideal for dropping the TouchPad on the dock for a quick top-off charge during the day. Unsurprisingly, HP's take on the Touchstone simply stands on a desktop instead of adhering via tiny suction cups. While HP has made no official announcement just yet, this dock would hopefully be compatible with the smaller 7" TouchPad slated for release in the coming months. Aside from the inductive charging capabilities and compatibility with HP's new Exhibition Mode, there is very little in the way of functionality on this dock. It simply holds and charges a TouchPad with a minimum of fuss. I had no issues whatsoever with the TouchPad not charging or falling off of the dock. The only caveat is that the TouchPad must be placed squarely in the middle of the dock in order to charge, as it will not charge if it's offset to either side by more than a tiny bit. Some informal testing did reveal the charge rate via inductive charging to take a bit more time than when charged directly via MicroUSB but the added convenience is well worth the slower recharge rate, especially considering the TouchPad's fairly impressive battery life. The original Palm TouchStone dock had a fantastically weighted feel initially, though some users reported problems over time with substandard interior components and faulty magnets. Since the TouchPad's TouchStone dock is devoid of any magnets, it relies on a small rubberized lip to keep the TouchPad secure docked while charging. I was especially impressed by the feel of the adjustable rear stand, as it was a nice brushed aluminum and seemed durable enough to hold up to years of adjustments. Overall, this seems to be a very well-built item and, assuming no form factor or spec changes are made, could easily last the user through several iterations of TouchPad. Make no bones about it, a tablet is already a splurge item accessory for most buyers, so a charging dock of this sort with a $79.99 MSRP definitely rings in as a luxurious extra for well-heeled TouchPad buyers. Inductive charging is no longer a rarity or a Palm-exclusive like it was two years ago, and HP appears to be unaware of this fact with its recommended TouchStone pricing. Cost issues aside, I found this to be an exceedingly well-designed and constructed cradle given its solitary function for charging. HP's dock definitely stands out from the pack of competing tablet docks with its native inductive charging tech but it is quite debatable if that is truly worth the substantial price premium. The $30 to $50 range seems to be the "sweet spot" for OEM tablet docks, with many Android tablet manufacturers already adding dock features such as multiple USB ports, remote control, analog audio or HDMI video output at lower MSRPs. Depending on how TouchPad sales fare over the next few quarters, this seems to be the ideal sort of device to use as a nice item to bundle with higher-end TouchPad SKUs or offer as a limited-time promotional freebie. Barring that, HP could simply drop its price to enhance the TouchStone's appeal to a much wider audience. "The tablet can only be docked in portrait mode which may be an issue for some issues." Not only does the last part of that sentence not make much sense, but it's not true. The TouchPad can be charged in a landscape orientation too (volume buttons on top). Only in landscape? The Touchpad needs to be bipolar like everybody that ever ran Palm, Inc.
OnTopic: HP, like Palm, is pricing it rediculously high and then will bundle, or sell it at huge "discounts". OffTopic: Looks like the wheels are coming off the WebOS community. I have never seen as much negativism as in the comments concerning the Pre3 6 month wait over @ P|C. Either HP shows up with several grainy "leaked" photos over the next couple of weeks or it appears to be over. They may be serious @ tablets and toasters etc, but it appears we are on the cusp of iPaq II for smartphones. I'm not even sure that the Pre3 ever gets released. If this is a mobile strategy by HP, then I dread the day when they lose focus. Feb 9th redux here we come. Dr Dre just jumped to HTC for the exclusive Beats on mobile agreement. HP, there long time partner, had no ability to show them a reason to go with their phone platform. Looks like the end of Palm mobile devices is literallty being measured in months and not years now. JMO. I think the wheels came off when Palm tossed out Palm OS and the developer community but they were squeaking long before that. -Failure to bring on color, multimedia, wireless connectivity in step with the competition (Sony, Dell and ironically Compaq). -Poor assortment of devices on various carriers. Case in point: no upgrade path for T-Mobile Palm OS users since the Treo 600, no upgrade path for Sprint users since the Pixi's release in 2009. -They treat their users as a cross between steadfastly loyal iSheep, utter idiots, and narrow-minded Rubinstein types (ie have never used a competing device or platform). My prediction: The Pre3 will be released on AT&T in very limited quantities (either through indirect resellers only, or online only or at retail with zero marketing support). The Pre 2 will remain the final VZW WebOS device and Sprint will stay far, far away from HP. The Veer, P2 and P3 will see drastic price reductions and various bundle promos & HP will go into a sort of WebOS smartphone dormancy period while they retool for a "unified" WebOS approach for smartphones, printers, tablets & PCs next year (like Google is doing with ICS Android 4.0 later this year). If THAT flops, then they swill swiftly and mercilessly pull the plug on WebOS. Interesting predictions. You may be right. $1.4B is a lot to spend to toss it all after 18 mos. I love the synopsis @ "direction", that pretty much sums up the insanity, disarray, and/or desperation of a poorly run operation. Look at HP's history with acquisitions - it's not a pretty picture. One has to wonder: why did HP buy Palm in the first place? They had a real cute little smart phone with really cool swiping cards. With an HP logo on one, everybody will get one just like they do printers. Interesting article. I tend to agree with the first comment tho ... if you want one handed usage on a touchscreen device then get a small one. Quit whining bc your thumb cannot reach across your 4.3" screen. 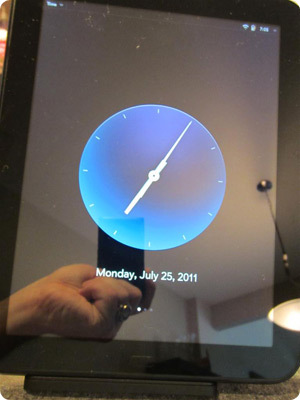 Capacitive TS glitz has replaced one handed functionality in mobile and it does not appear to be changing anytime soon. Googorola™: the end of webOS? With Google buying Motorola (and not just for it's patents), Microsoft's relationship with Nokia and Apple's closed system squeezing from all directions, HP needs to start licensing webOS to companies like Samsung. Immediately. RE: Googorola™: the end of webOS? Oooops! Too late (my bad). Can you at least comment on the spectacularly horrible timing of the announcement? I mean, the TP launched 6 weeks ago (with the "hard" launch a month ago, the 64GB TouchPad became available for sale today in France and the Pre 3 unofficially hit the UK, what, 2 days ago? And the TouchPad 4G and 7" wi-fi and 4G TouchPads are likely sitting in a warehouse somewhere ready to go. You'd think HP would have just kept quiet until the end of the year or at least closer to the holidays to can anything. They stand ZERO chance to unload inventory at anything less than firesale prices now! Speculation: Which device is destined to become a bigger collector's item: A Michael Jordan m100, a Claudia Schiffer Vx, a "Patriotic" m505, a 128MB Centro, a Treo 500V, an 8GB Pre 3, a 64GB TouchPad or a 7" TouchPad Go? You know what a tease I am! "Speculation: Which device is destined to become a bigger collector's item: A Michael Jordan m100, a Claudia Schiffer Vx, a "Patriotic" m505, a 128MB Centro, a Treo 500V, an 8GB Pre 3, a 64GB TouchPad or a 7" TouchPad Go?" None of the above. Foleo is the king of the Palm hardware hill. First honorable mention goes to the overclocked Palm Pre that were demoed (Smoke & Mirrors Style!) at CES in January 2009. Way to pull the wool over the media's eyes, Eddie! Ethics? Wat dat? Second honorable mention goes to Samsung SPH-i550. Guess how many people knew about the bailout on webOS last week BEFORE it was announced? And how many of them made a KILLING on HP's stock? Any Web OS or Android developers here? This is off subject but if you are looking for an idea for an app TCL has a new product for the Golf & NEV industries going on the market in January. The hardware interfaces with a phone or pad via Bluetooth. I only do iOS apps so if you would like to write an app similar to BattSix I'll provide the interface specifications.